The book Blue Ocean Strategy by W. Chan Kim and Renée Mauborgne was published in 2005, with an expanded edition following in 2015. Now a new book Blue Ocean Shift by the same authors has been published. It is a good read with many interesting and relevant examples (always a sign of a good business book, for us at least). However, the same major flaw in the authors’ thinking persists. The fill title of the book including the words ‘beyond competing’ make this clear. We believe that to be successful in blue oceans, first you need to identify one. But secondly you need to find a way of ensuring that competitors cannot enter and prevent you creating value for your business. Indeed, one example quoted in the first chapter of the book demonstrates the point well. Groupe SEB, a French multinational, wanted to compete more successfully in the market for French fry makers. The conventional wisdom was that making French fries required frying and that frying required a lot of oil. They set out to design a fryer that made healthy, fresh fries without frying. The result was a product called ActiFry, which requires no frying and uses only one tablespoon of oil to make two pounds of fries. Ten years later ActiFry remains the market leader. The authors point out that this is partly due to the patents that SEB secured. So, here we have an example of a business that identified a blue ocean (a way of producing fries with hardly any oil) which was then able to maintain this success due to the competitive advantage they achieved through registering patents. 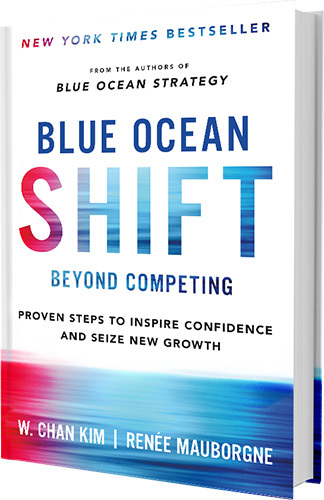 It does not have to be either finding a blue ocean or achieving a competitive advantage. It can be both. Many businesses who are the first entrant into a new market (a blue ocean) are not successful over time. Online bookselling (where the first player was not Amazon but Charles Stack). Disposable nappies, or diapers, (where the first player was not Procter & Gamble but Chicopee Mills). Online stockbroking (where the first player was not Charles Schwab but Net Investor). The genius of Steve Jobs, after his return to Apple in 1997, was that he both identified a blue ocean and then created a sustainable competitive advantage (several times), with iPod/iTunes, the iPhone, and the iPad. Jobs did not just identify the blue oceans. He acted to ensure that Apple captured the value by creating a sustainable competitive advantage. Indeed, Apple began the development of the iPad before the iPhone but changed direction when competitors looked as though they would find ways of enabling users to download a large amount of music onto a mobile phone. Apple’s R&D was redirected to the iPhone, and the iPad followed later. The rest (or at least a significant amount of it) is history. The organisation Thinkers 50 have recently announced their latest global ranking of management thinkers. Chan Kim and Mauborgne are ranked fourth, one higher than Michael Porter of Harvard. Porter argues that to be successful in the long run a business needs to adopt a strategy that cannot be copied successfully by competitors – it needs to create a competitive advantage. However, this is not necessarily by doing the same thing as the competition (operational excellence) but by making choices and doing something different so that competitors cannot copy you (strategic positioning). Examples of strategic positioning he gives in his article ‘What is Strategy?’ published in 1996 include Southwest Airlines and IKEA. Both companies are still achieving above average returns in their chosen industries over 20 years later. There are many good points in the book. The authors differentiate between disruptive creation (offering a breakthrough solution for an existing industry problem) and non-disruptive creation (identifying and solving a brand-new problem or seizing a brand-new opportunity), which is important as the market dynamics are likely to be very different. They also offer many techniques that teams can use to analyse their industry in order to identify potential blue oceans. The blue ocean approach is strong, but it could be brilliant if it built on the work of earlier business writers rather than trying to show that they are wrong.